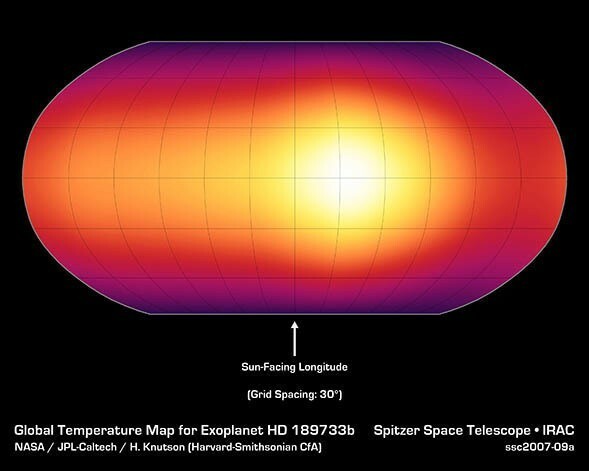 The figure below is a temperature map of the exoplanet HD 189733b. This planet is a Jupiter-type planet that orbits very close to its parent star, orbiting about once every 53 hours. Because of its short period, and relatively close distance (about 60 light years), we’ve been able to measure its surface temperature in the infrared. The result is the map below. The image shows the atmospheric temperature centered at the longitude facing the parent star. It is clear that the hottest region is not the region directly facing the star, but the region about 30 degrees to the right, which is very interesting. The planet is so close to its star that it should be tidally locked. This means the same side of the planet faces the star all the time. This is similar to the way the Moon is tidally locked to the Earth, and thus always shows the same side to us. Because of this tidal-lock effect, one would expect the hottest region of the planet to be the hottest region, while the far side should be relatively cool. This is not the case, so there must be large winds driving its upper atmosphere. Given the 30 degree offset, this would indicate that the surface of the planet is driven by winds racing at about 6,000 miles per hour. The fact that there is not a corresponding cold region on the far side reinforces the idea that there are high winds in the upper atmosphere. Just what drives those winds isn’t entirely clear, but we do know that there is a great deal of interaction between the atmosphere of HD 189733b and the parent star. The star is active with solar flares and x-ray bursts, just like our Sun. Since the planet is so close, these can give the planet a thin atmospheric tail, similar to a comet. These interactions may be what drives its atmosphere to high speeds. This tail effect is also a boon for astronomers. Because gas is streamed out away from the planet, we can observe its makeup. So we know, for example, that its atmosphere contains water vapor, oxygen and methane. It’s pretty amazing that we can now start looking at the temperatures and atmospheric compositions of planets around other stars. Paper: Heather A. Knutson, et al. A map of the day–night contrast of the extrasolar planet HD 189733b. Nature 447, 183-186 (2007).